75 GRAMS OF 2MM SEED BEADS. GLASS MULTI COLOURED BEADS. (THE GOLD BEADS ARE A LOT BRIGHTER THAN PHOTOGRAPH SHOWS). You will receive the beads in a grip seal bag, which can be resealed and reused. Length : approx 2 to 3mm. Hole size : approx 1mm. 3000 (approx.). 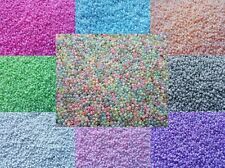 Opaque Glass Seed Beads 2mm 50g. Colour : opaque. Size : 11/0 2mm (approx.). Quantity : 3000 (approx.). Material: glass. Buy 3 Get 1 Free Hole size : 1mm (approx.). 3000 (approx.). 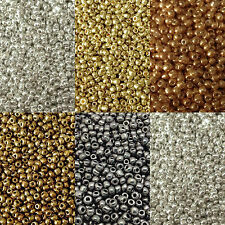 Iris Pearl Glass Seed Beads 2mm 50g. Colour : iris pearl. Size : 11/0 2mm (approx.). Quantity : 3000 (approx.). Material: glass. Buy 3 Get 1 Free. 3000 (approx.). Size : 11/0 2mm (approx.). Quantity : 3000 (approx.). Material: glass. Buy 3 Get 1 Free Hole size : 1mm (approx.). 3000 (approx.). 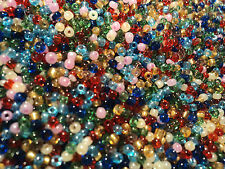 Transparent Glass Seed Beads 2mm 50g. Size : 11/0 2mm (approx.). Colour : transparent. Quantity : 3000 (approx.). Material: glass. Buy 3 Get 1 Free. 3000 (approx.). Opaque AB Glass Seed Beads 2mm 50g. Colour : opaque ab. Size : 11/0 2mm (approx.). Quantity : 3000 (approx.). Material: glass. Buy 3 Get 1 Free. 3000 (approx.). Frosted Transparent Glass Seed Beads 2mm 50g. Colour : frosted transparent. Size : 11/0 2mm (approx.). Quantity : 3000 (approx.). Material: glass. Buy 3 Get 1 Free. Finish : Transparent glass with a frosted finish. Colour : colour mix. They are great for a wide range of craft uses, but if uniformity is important to you, then these will not be the beads for you. The price of the cheapest item will be deducted from your order total. Message us to discuss bulk prices. Colour : Multicolour. The price of the cheapest item will be deducted from your order total. They are great for a wide range of craft uses, but if uniformity is important to you, then these will not be the beads for you. 50Grams OF 2mm SEED BEADS. various shades of beige, cream and stone colour. "BEIGE & CREAM". FOR OTHER COLOURS AND TYPES OF BEADS. SENT IN HANDY RESEALABLE PLASTIC BAG. LOADS FOR ANY SEWING OR CRAFT PROJECT. They're basically a light green with a brilliant sparkle, and the AB coating adds flashes of multiple colours when the facets catch the light. These rhinestones were AB coated by E H Ashley. 75grams of 2mm GLASS SEED BEADS. 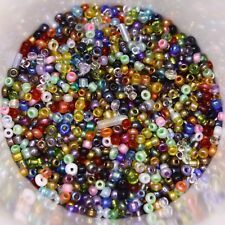 VERY PRETTY MIX OF BRIGHT MULTI-COLOURED RAINBOW BEADS. AND GOLD GLASS FOIL LINED THAT REALLY SET THESE OFF. LOADS FOR ANY SEWING OR CRAFT PROJECT. FOR OTHER COLOURS AND TYPES OF BEADS. 2mm round glass seed beads that have a smooth surface and a striking finish. You will find a few 2mm tubelets in your bag too! Use these beautiful seed beads to decorate your clothes, scarves, pillowcases and handbags. RAINBOW OPAQUE GLASS SEED BEADS THEY LOOK GREAT JUST LIKE WINE GUM SWEETS. 50grams OF 2mm. SENT IN HANDY RESEALABLE PLASTIC BAG. OCCASION: Perfect for those who loves DIY crafts making. MULTI-PURPOSE: Can be used to make bracelets, necklaces etc. Item Size: Approx. (L W H)1.5 1.5 0.5cm. Main Material: Wood. 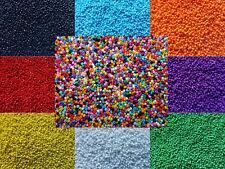 MULTI COLOURED GLASS SEED BEADS. FOR OTHER COLOURS AND TYPES OF BEADS. GREAT FOR JEWELERY MAKING. LOADS FOR ANY SEWING OR CRAFT PROJECT. 50grams of 2mm AURORA BOREALIS COATED GLASS SEED BEADS. DARK MULTI COLOUR SHINY FINISH. FOR OTHER COLOURS AND TYPES OF BEADS. LOADS FOR ANY SEWING OR CRAFT PROJECT. SOLD BY WEIGHT. Ideal for small projects. UK 2nd Class - FREE. 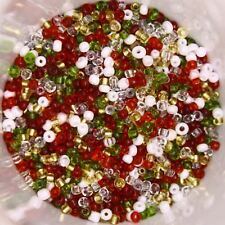 75 g transparent mixed glass seed beads. Miyuki code 11-2063. Seed beads sold in a 24g tube. Colour: matte indigo iris. Size 11/0 (2mm) seed beads. 2640 seed beads. These flawless Japanese beads have a lovely smooth matte surface and will produce a beautiful petrol like effect in your jewellery designs. Size: Approx 2mm. Quantity: each colour about 1200pcs-1300pcs. Material: Glass. Color: 8 colours. These precision cut faceted seed beads are made from heat induced and fire polished Czech glass. Colour: crystal sliperit. 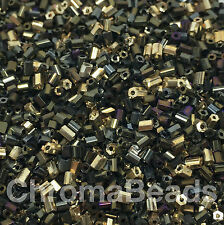 Bead size 2mm. We have a huge collection of glass beads, semi-precious gemstones, silver and gold beads, pendants and charms, alphabet letter beads, Swarovski beads, horn and bone beads, pearl beads, a variety of stringing materials, quality findings and much more. Size: Approx 2mm. Material: Glass. Quantity: each color about 1200pcs-1300pcs. Color: 8 colors. Glass seed beads suitable for necklaces, earrings, bracelets, badges accessories, pendants, handicrafts, clothing accessories and other DIY jewelry making. - Fashion loose spacer beads. 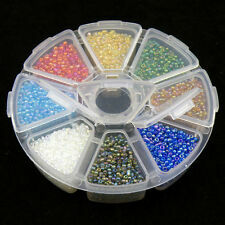 - 12 Beautiful colors mixed beads,transparent plastic box. Colour: jet capri gold. They have an exquisite rose gold finish on a jet black surface. Use them as an addition to your jewellery designs for an extra sparkle. We have a huge collection of glass beads, semi-precious gemstones, silver and gold beads, pendants and charms, alphabet letter beads, Swarovski beads, horn and bone beads, pearl beads, a variety of stringing materials, quality findings and much more.